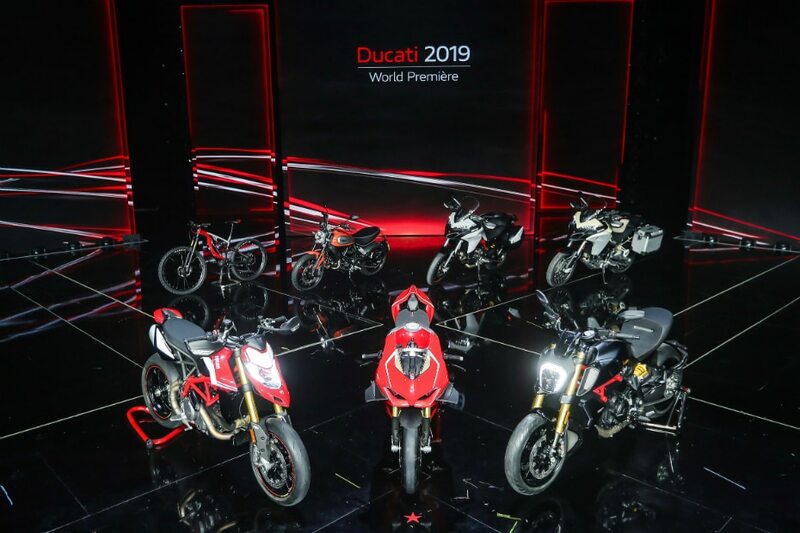 Ducati showcased the new 2019 Scrambler range consisting of the Scrambler Icon, Cafe Racer, Full Throttle and Desert Sled. Along with cosmetic updates, these bikes get new safety features, including cornering ABS, as standard. Other updates include a revised suspension setup and a new seat for more comfort. Other comfort add-ons include a hydraulic clutch and an adjustable front brake lever. Along with new switchgear, the Scrambler range also received an updated instrument console, which now shows gear position and fuel level. The 2019 Scrambler also gets Ducati’s multimedia system that allows the rider to answer calls or play music on the move. Ducati seems to giving a serious look at the electric mobility sector and the first to come out of this endeavour is the MIG-RR E-MTB. The mountain bicycle, which was developed in collaboration with Italian electric bikemaker Thok Ebikes, gets electric assist from a Shimano Steps E8000 motor which puts out 250 Watts (0.3PS) along with 70Nm of torque. Power comes from a 504Wh battery. The bike weights 22.5kg and gets top-spec components like Fox Factory Kashima suspension with 170mm front and 160mm rear wheel travel, 29-inch front and 27.5 inch rear Mavic wheels, carbon-fibre Renthal handlebars, 4-caliper Shimano Saint brakes and an 11-speed Shimano XT gear set. The bike should be available at Ducati dealerships by early next year. The Monster 821 Stealth, as the name implies, gets a matte black paint job with red and silver livery and a small windscreen above the headlamp. The suspension setup receives an upgrade in the form of new adjustable front forks. While the motor remains unchanged, the Monster 821 Stealth gets Ducati’s Quick Shift (DQS) system. The new Hypermotard is now slimmer and the seat, whose height remains unchanged, is more accessible on account of it being narrow. The design is more supermotard-like and the bike is now 4kg lighter than its predecessor. Its 937cc L-twin motor has been updated and now makes 114PS. It also receives major updates in the electronics department and sees the introduction of Bosch Cornering ABS with the Slide by Brake function, Ducati Traction Control EVO (DTC EVO) and Ducati Wheelie Control (DWC) EVO. The hotter Hypermotard 950SP gets a flatter seat and forged Marchesini wheels that further reduce weight by 2kg. It gets longer travel Ohlins suspension all around which increases ground clearance and improved lean angles. You also get a bi-directional Ducati Quick Shift (DQS) as standard. The new now gets an updated fairing that makes it look more like its larger sibling, the Multistrada 1260. Its 937cc L-twin motor gets a hydraulic clutch for easier shifts and a new safety update in the form of Bosch Cornering ABS. You now have a new top-spec Multistrada 950 S that gets features like electronic Ducati Skyhook Suspension (DSS), bi-directional Ducati Quick Shift (DQS), full-LED headlight, 5-inch colour TFT display, handsfree system, cruise control and backlit switchgear controls from the Multistrada 1260 S.
The biggest update to the second-gen Diavel is the introduction of a 1262cc DVT L-Twin motor that replaces the existing 1198cc L-twin unit. The addition of DVT tech allows for power to be available across the rev range. It makes more power as well - 159PS and 129Nm. The new Diavels look compact but aggressive thanks to the sharp design lines. Features include an all-LED headlamp, a colour TFT screen and a multimedia system. The chassis has been updated and features a sharper rake and trail, while the wheelbase is now longer than before. It now gets cornering ABS as standard as well. The more evil Diavel 1260S variant gets fully-adjustable Ohlins suspension, machined alloy wheels, Brembo M50 monobloc calipers and bi-directional Ducati Quick Shift. Touted as the most powerful Ducati ever made, the Panigale V4 R’s downsized 999cc motor makes a staggering 221PS at 15,250rpm (road-legal trim) and 234PS at 15,500rpm with the Ducati race exhaust made by Akrapovic. A race engine for the road, this V4 motor gets lighter engine internals that reduces the weight of the powerplant by 2kg. Overall, the V4 R weighs just 193kg! The fairing is now wider and features large vents to improve cooling. The most striking part of the V4 R is the inclusion of carbon-fibre winglets borrowed from Ducati’s MotoGP bikes. This is a proper WSBK-spec race bike that can be legally ridden on public roads.